And now we see these rocket attacks from Hamas and Gaza. 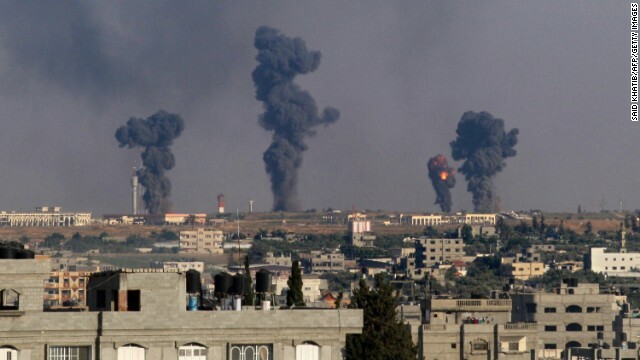 Israeli air strikes into Gaza. The more one side attacks the other side is inclined to hit back. How concerned are you that this escalation of rockets and air strikes will escalate into another all-out war, if you will? A lot of times you see these kind of flare ups you don't know whether anything is going to happen – most of it doesn't flare up. In this case, what's happening is on both sides, there’s an internal compulsion and an internal dynamic which is pushing them to a confrontation that maybe they don't rationally want. By that, I mean if you look at Prime Minister Benjamin Netanyahu, he has already lost his foreign minister and the support of a right-wing party. There's pressure for him to act from the right. If you look at Hamas, Hamas, as you know, hasn’t been doing particularly well over the last few years. It has been losing out to more radical, more militant alternatives. So they feel the need to do something. Neither side can try to do something cooperative at this moment. So it almost reminds you, in a very small microcosm, of the events that led to World War I, when nobody rationally wanted a conflict but nobody could find the way to back down because they were being pushed by the internal dynamics. That seems exactly what's happening here. So it's difficult to see how this stops. At what point does one of the sides say, you know what, let's have a moment where we make a preemptive concession. We do some kind of peace talks. That's not in the cards right now. The U.S., as you know, doesn't deal with Hamas. The State Department regards Hamas as a terrorist organization. Last time there was a war, if you will, between the Israelis and Hamas in Gaza. The Egyptians brokered a ceasefire. Who could do that now? Well, it's more difficult now because General el-Sisi and the new Egyptian government have very poor relations with Hamas. They've actually cut them off in various ways. So it's tough to imagine that dynamic playing itself out well. The United States has, of course, no contact with them. So perhaps you'd end up using somebody like Qatar or Saudi Arabia. But again, the dynamics on the ground are really what seems to be motivating people. Nobody really wants this confrontation, but you have to show that you're tough. And you have to show that you're responding. And that's the dynamic we're in right now. I don't think an outside mediator is going to help. "The fact that one of the three teenagers who were killed by the Palestinians was an American citizen – how much could that, or should that, change the U.S. posture on this unfolding very serious, potentially very deadly situation in the Middle East? " See it's very easy to change a word here and a word there, Mr. Zakaria you are no expert. israel must start killing hamas. not just their buildings but them. israel is fighting to defend itself. they are terrorists, murderers... they die. U R right sir, Israelies are terrorist, they do not belong there but only to Hell and Hell where they gonna be soon. Indeed Both the Palestinian teen and one of the dead Israeli teens are/were American citizens. Fareed's liberal knee jerk article was based on only mentioning that the Palestinian was American. So typical! Whose publicly stated goal is to destroy who? What we sorely need to do is to set up a comprehensive peace plan between the Israelis and the Palestinians, including Hamas. Then set up a trust fund to purchase the Sinai from Egypt and give it to the Palestinians to develop and in turn, have the Palestinians or Hamas vow to stop attacking Israel. This is what the Israelis should have done back in 1982 instead of simply returning it to Egypt under Hosni Mubarak. I am sure Hiltler is watching all this and thinking Why the hell he did not finish all of them. That's funny – Osama Bin Laden was saying the same thing after watching Americans sky diving from the Twin Towers. Hitler's looking at nobody. He's all burnt up in hell.... which is where you're definitely heading with comments like that. Guilty by association- This American teenager should not have been hanging out with idiots throwing rocks and chunks of bricks. I would have shot more than just one them, these cowards pitching rocks then running away are luck they didn't get shot in the back while fleeing the scene. What nation on earth would allow its neighbors to launch missiles into its civilian population? I would enter Gaza and when I left nothing would be standing or living. Good place for America to dump its landmines now that they are banned. Those 3 dead Israeli's also got what they deserved, since everyone in Israel should die ... right? Maybe America should dump all those chemical weapons we have in Israel. Wouldn't that solve the problem as well? Nothing more ignorant than American's like Jim who like to drop their bombs on civilians protesting a murder. Gaza, you mean the strip of land that Israel, unpopularlly, gave to the palastinians in the name of peace? That Gaza? The gift that they thanked Israel for by electing a terrorist and continue to fire rockets from? That Gaza? Thank the USA, without USA Irasel will not exit one day. Trust me time is coming all these terrorists jews will be out of Palestine. Still doesnt answer my question. If they are doing so well they shouldnt need financing from us. And with the financial mess this country is in we cant afford to be financing other countries. Not to mention the growing number of homeless veterans in this country, that our government doesnt deem worthy enough to come to their aid! It must be absolute hell to look in a mirror and realize you're Sarah Palin. She should stick her head in a microwave. But why waste a perfectly good microwave? Then she should dive head first into a wood chipper. This is a time to celebrate these brave Palestinian warriors have struck fear into the Jews killing the Jews children and launching missiles has far has 120km into Israel such a great achievement soon even greater things of suffering and pain will happen to the Jews. Fareed hasn't quite got it right re Israeli politics. Netanyahu can quite easily look more toward the center (and even slightly left) for an alternate coalition. Israeli politics in general has moved right, so much so that Likud is actually only slightly right of center now. Netanyahu doesn't need Lieberman if he chooses not to deal with him. The choice is his. Well we could all drone on and on about the Israeli Palestinian conflict, but the upcoming Sunni Shia conflict will make it look like a kindergarten tiff. Gaza is shaping up to be one of the battlegrounds. Why won't the Muslims ever defeat Israel? Because they can't stop fighting each other. Looking at the Gaza incident, I fear that a picture all too familiar is re-emerging: World War 2 under Nazism. Under Nazism Sarin was used in Auschwitz, Under Israel White Phosphorus is used on Gaza. Both used propaganda coupled with racist rethorics to justify their war and actions of killing million of innoncent palestinians bystanders. Nowadays, so many people are spreading animosity against Arabs on social media. Going as far as promoting exterminating the Arabs.